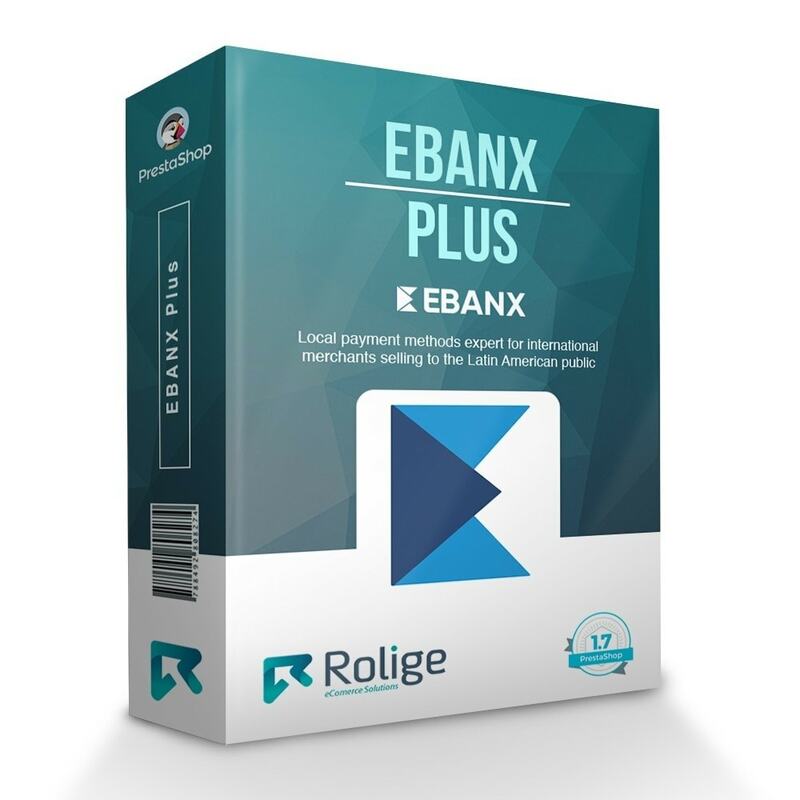 EBANX is a comprehensive, cross-border payment solution that eliminates all barriers for international merchants to sell online in Latin America. Offering local payment methods with real-time processing. More than 20 payment methods in the same module. 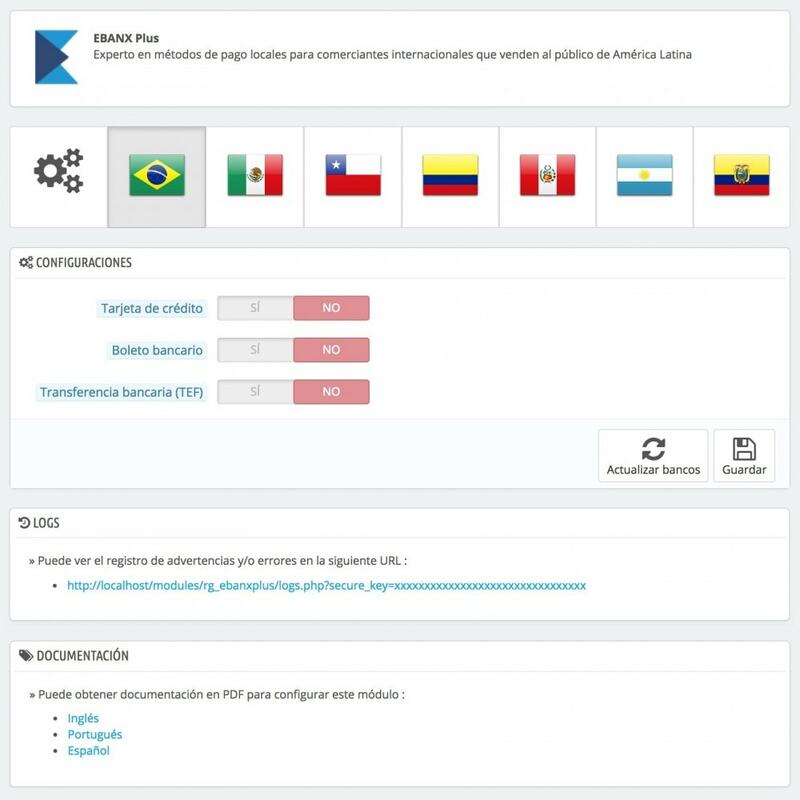 Experience in local payment methods in Latin America. Complete administrative panel that concentrates the information of all international transactions in one place. Proven fraud protection that guarantees low fees for refunds. Provides the consumer with the security of cash payments. Multiple local payment options that increase consumer confidence. Accepts dollars (USD) and all local currencies of the participating countries. 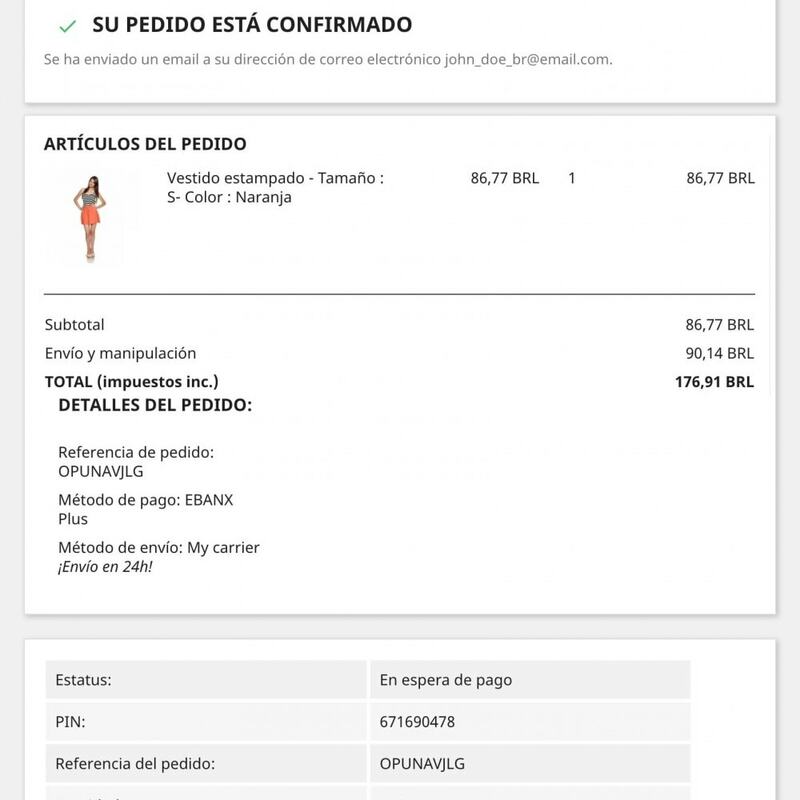 Possibility of creating specific rules to groups of customers or amount of carts, so that they are treated in a different way. Internal error log in a file. It does not require override files for it's correct functionality. All our developments are validated by PrestaShop. Support warranty in the module's bugs. We can customize the module or make the necessary modifications. Contact us to request an estimate. 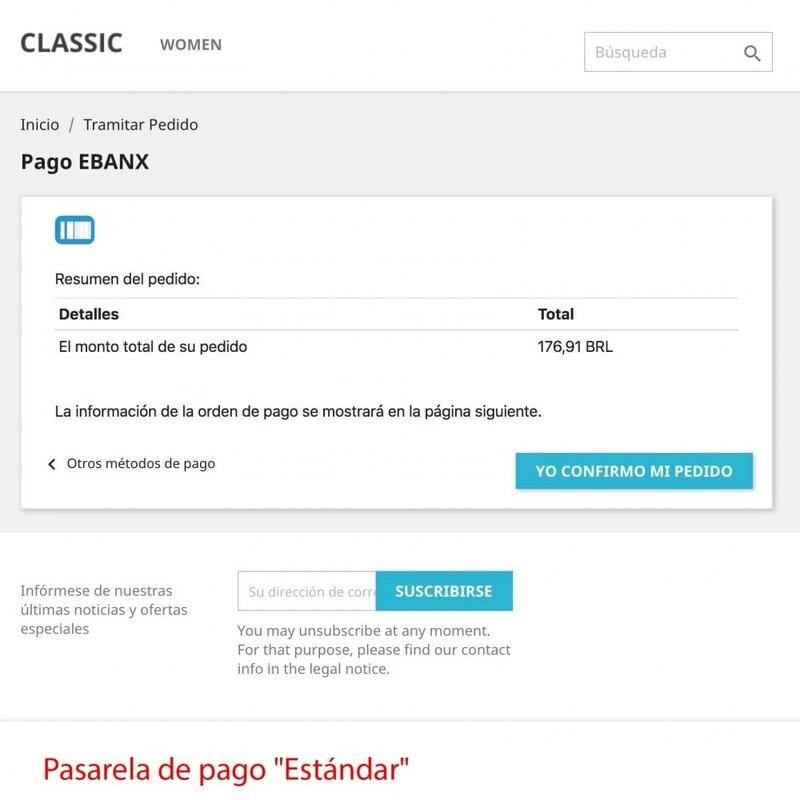 EBANX currently accepts local payments from seven countries (Brazil, Mexico, Chile, Colombia, Peru, Argentina and Ecuador). Below are all the payment methods supported by country. Responsive payment gateway that provides the best user experience on any device. Transactions are confirmed in real time. Transactions are validated before being processed for a better user experience. Anti-fraud system that allows to detect fraudulent cards in real time. 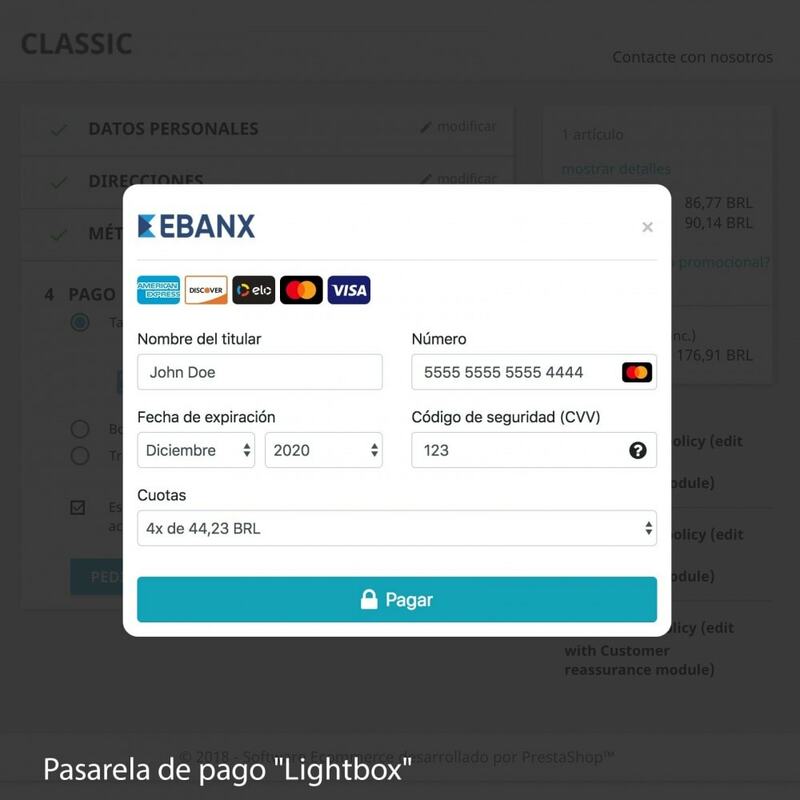 All transactions are stored and linked to the EBANX panel. Detailed error system, both in the module and the EBANX panel. Automatic update of payment status via webhook. 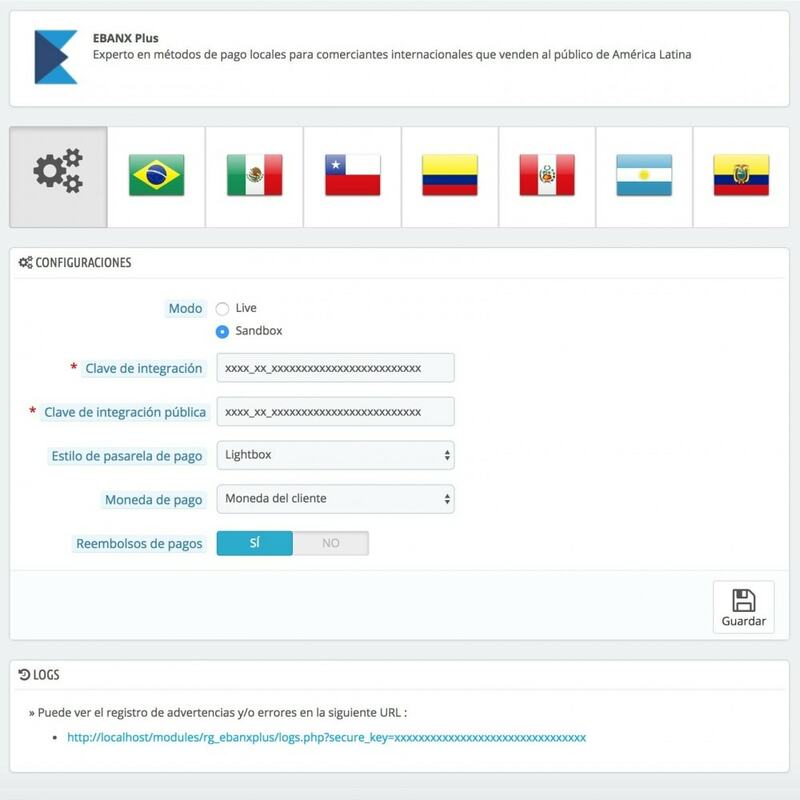 Simple and separate configurator by country. 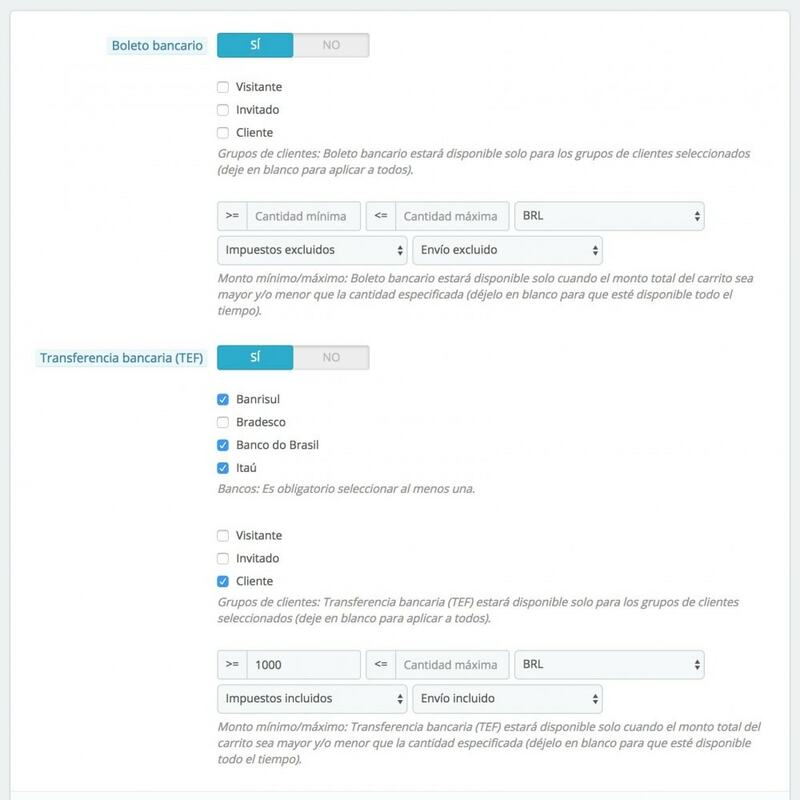 Option to store Sandbox and Live credentials separately to allow rapid testing in both environments. It has two different styles of payment gateway (Standard and Lightbox). Possibility to specify in what type of currency the payment should be made. Option to enable a button for refunds in the order detail. 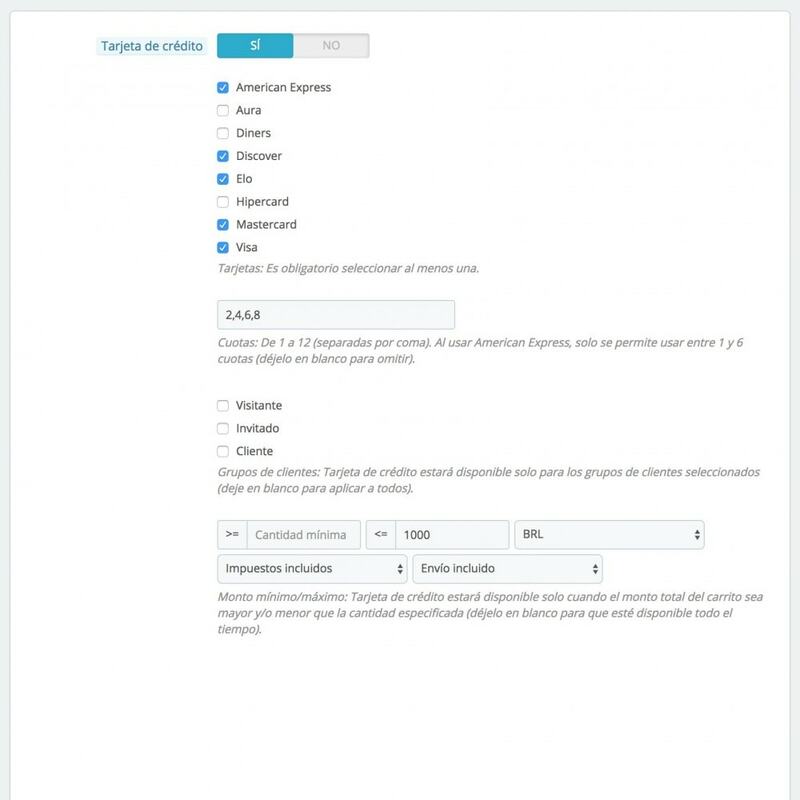 Option to activate/deactivate the payment gateways separately for each of the countries. Option to activate/deactivate the payment gateway only to specific customer groups. Option to activate/deactivate the payment gateway for a minimum and/or maximum amount of the shopping cart. Option to enable only certain card types. Instalment payment option with credit cards. Option to enable only certain types of banks. Button to update banks (only for participating countries). 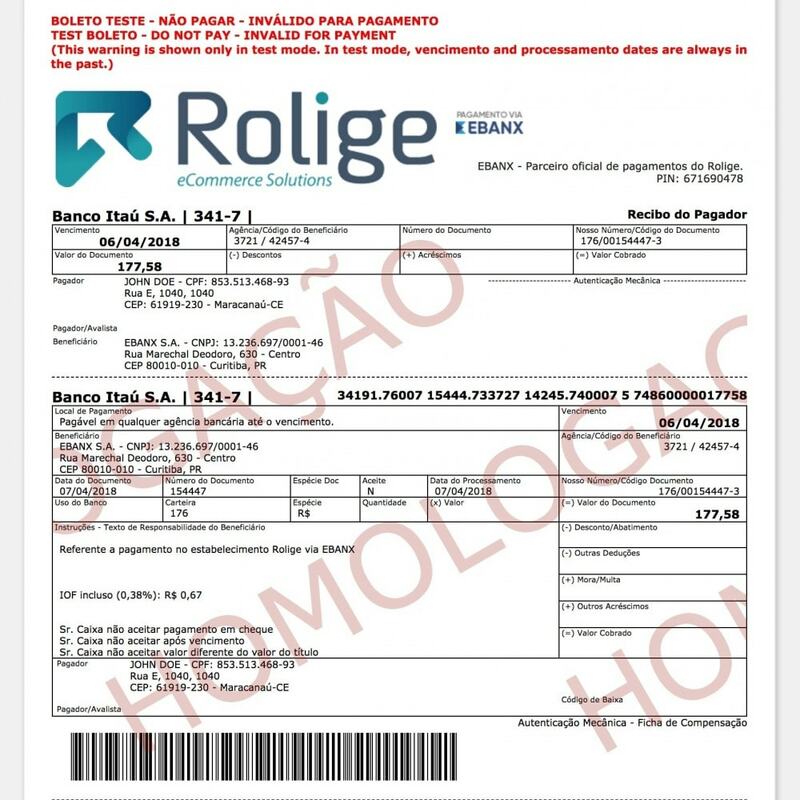 Complete and detailed documentation in english, portuguese and spanish. It is necessary to have an active EBANX account. If you do not have one yet, you can create it on the official EBANX site. Simple and functional payment experience on any device. Greater confidence with local payment methods that the customer can easily identify. Constant follow-up notifications via email this through EBANX. The validations of payment with credit and debit cards are in real time, allowing the customer to try again with a different card in case of any problem. Instalment payment option. The customer can choose to pay in instalments or in cash. In case of using credit and debit card payments, it is important to have SSL certificates to safeguard your customer's information. For certain countries it is mandatory the Zip Code, phone number, State or tax identification number, therefore it is important to establish these fields as “required” in your address format. The installation is completely attached to the native PrestaShop process. It does not require any kind of special intervention or installation of override files. 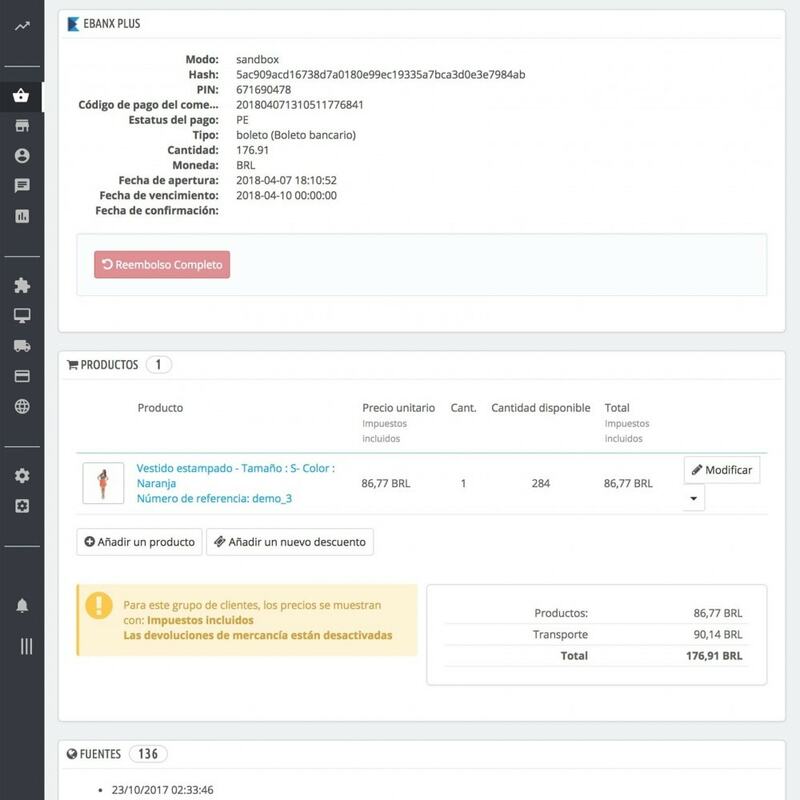 Envoyez des notifications push illimitées aux navigateurs Web sur n'importe quel appareil, même si le site Web de votre boutique est fermé, à l'aide de filtres de segmentation avancés basés sur PrestaShop. Détectez le pays et la langue de vos visiteurs et configurez les redirections, la langue par défaut du client, la devise et le transporteur, en plus des autres actions.